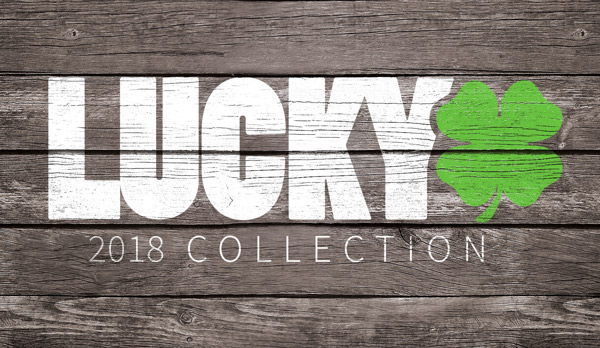 Us at Lucky Scooters contantly strive to innovate, in order to provide you with the tools you need to get the high quality pro scooter that you have been dreaming of. 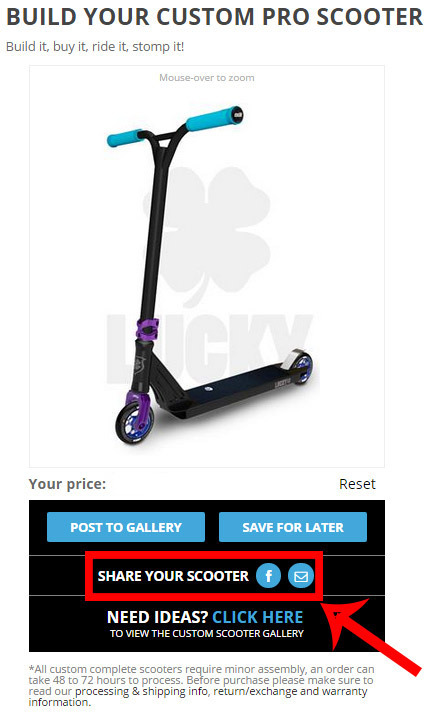 In order to accomplish this goal, we wanted to come up with an entirely new, user-friendly way to go pro scooter shopping/building that would be simple and straightforward. In the last year or so, we came up with the tool that we have been searching for. The Lucky custom pro scooter builder allows pro scooter riders to go online and build their own Lucky complete pro scooter from the ground up, using any available parts they choose in the color options that they want!! How sick is that!! The Lucky Scooters custom pro scooter builder displays every Lucky Scooter product that is available, out in front of you. You can individually choose your scooter deck, wheels, fork, bars, clamp, grips, brake, and pegs if you desire, for your custom build and you also get to choose the sizing and color for all of these components. On top of that, when you are done building your Lucky custom complete you can even save your work and name it, which gives you the option to either buy it now or come back to it later! just to let you know... Lucky Scooters ships your custom pro scooter completely put together...All you have to do is put the bar on the scooter!!! Even better!! Essentially, the Lucky Scooters custom scooter builder is revolutionizing the way that people are shopping for their complete pro scooters. Perfect for parents who don’t quite understand how the whole process works and tons of fun for kids looking to build a new scooter. 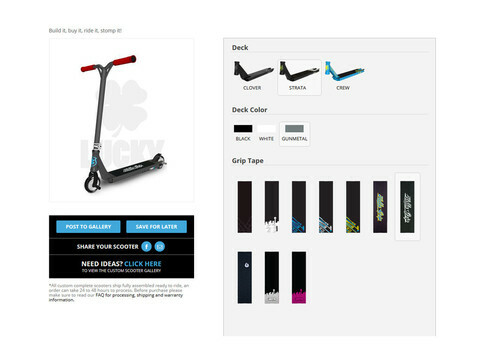 If you have never seen it before, be sure to go check out the custom scooter builder at www.luckyscooters.com today!